I felt the need to make myself a pair of suitable garters for my 1840’s outfit. 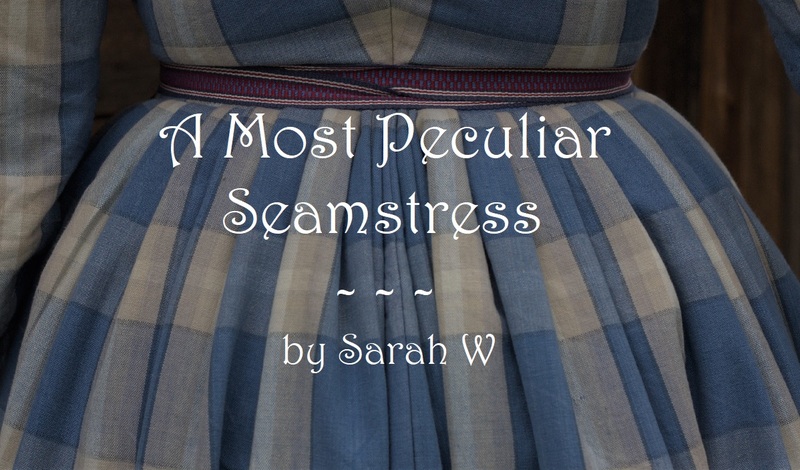 I had raided my closet and cut down a pair of too small white cotton tights to make a pair of over knee stockings (a budget variety, if you like me can’t afford reproductions – just make sure to stitch the tops, so they don’t unravel), but like their 19th century counterparts, they wouldn’t stay up on their own. 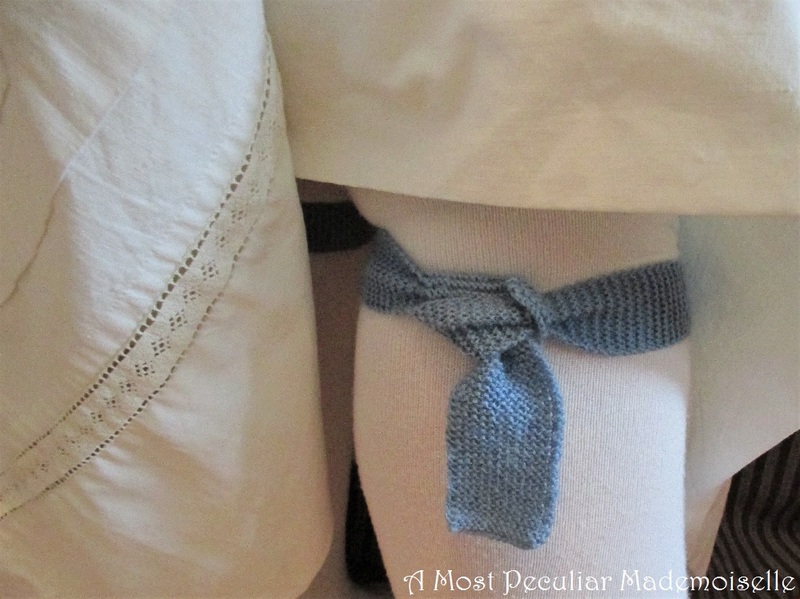 I felt like knitting and knowing I had come across knitted garters in the mid-19th century before, I went to the internet to see what I could dig up. 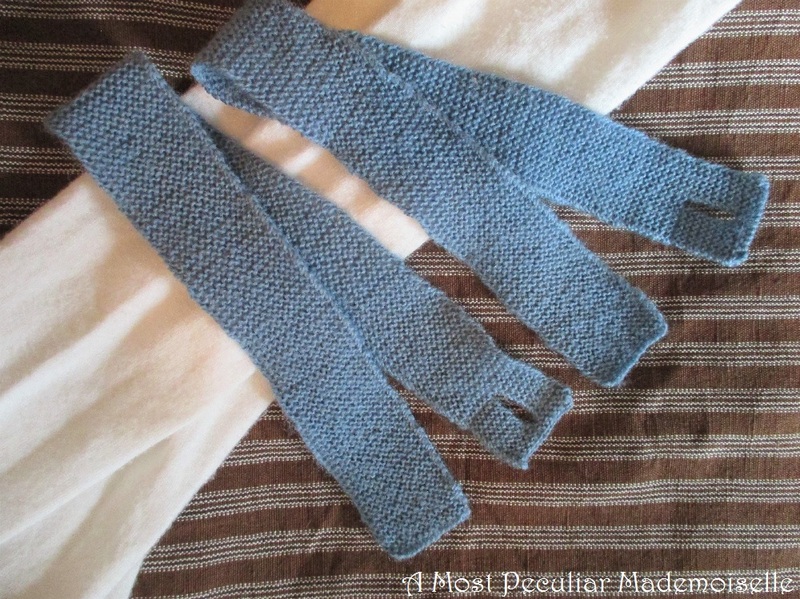 After a short search, I found that a description of how to make knitted garters were present in The Workwoman’s Guide from 1838, which suited my period just fine, though I have yet to find an example of knitted garters from this period in Sweden. I looked through my stash of yarn, and picked out a soft blue wool, not too thick. I used knitting needles 2 mm (US 0, UK 14), and with 14 stitches I got a width of 4 cm, not too far from the “nail, more or less, wide” mentioned in the description. To really have them a nail wide (a nail being equal to 5,7 cm or 2 1/4”) seemed too wide for comfort. I also made mine shorter than the 2/3 of a yard (about 60 cm) stated in the Guide, as 46 cm worked just fine for me. I knitted in a hole at one end, described as optional, which might be why I didn’t need the full 60 cm: I just wrapped the garter round my leg, pulled one end through the hole, and tied it off. This was a quick and simple project, just what one needs once in a while. The garters are really comfortable to wear, and though no one will see them, I like the fact that they are blue. When in active use, I fold my stockings down over the garters though, I feel it makes it more secure and comfortable, as the stockings will just roll down to the knee otherwise, which is really annoying. Nice garters, and like the look of how they're tied using the hole – tying two ends wouldn't look as neat. Thanks for the tip on cutting off cotton tights, that's a great idea for period looking stockings (custom length, and no elasticized tops)! A very cute project. May I inquire about your petticoat? The details are so pretty. Perhaps you have a post on it?